Irregular Choice Eat Me Whole. Dig these BabyKayKs? I do. Funny part is I dont really care for the new peep toe boot type jump offs that everybody rocks these days, but I likey thesey. Irregular Choice is hitting us with this Eat Me Whole (Biege) 4.5 inch heeled shoe. 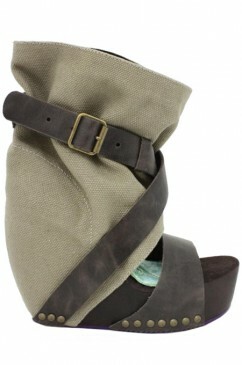 The leather straps & slouchy canvas gives the shoe a very unique vibe. I love anything that has that rusty worn type of feel to it. You can add these to your closet for about $200..
these are speaking to me!!! Are you selling them because I have the polka dot pair but have been searching for a solid color. If you are selling what size are you and how much? If anyone has a pair they would like to sell let me know.